Derek's E.D.G.E Fitness Blog: What is a Greens Supplement and Why Should You be Taking One? What is a Greens Supplement and Why Should You be Taking One? I have to admit something… A couple of years ago I started talking to all of you about a supplement/nutraceutical company that a very close friend of mine started. What I have to admit is that although I was very proud of the three products he had formulated (a Joint formula, Multi-vitamin-mineral-omega pack and a Phytonutrient Greens formula) I really didn’t stick with the Greens product. My friend Travis convinced me of its benefits, but I didn’t take it as seriously as I should have. I have stuck with his multi-vitamin-mineral-omega daily pack, but I just let the Phytonutrient Greens sit in our fridge. Only recently have I been researching the explosion of Greens products in health food stores and their proposed benefits. The bottom line is this: Although I eat a pretty good diet and take a high quality mulit-vitamin-mineral-omega (fish oil) I still don’t consume enough fruits and vegetables. As a matter of fact, I work hard to keep my sugar content down to stay lean and that naturally limits my fruit intake. Nevertheless, what I am missing is a huge array of phytonutrients (nutrients beyond vitamins and minerals found in food) that nutrition scientists are just starting to learn about. The main benefit of these phytonutrients is their ORAC value. ORAC value is the National Institute of Health’s way of measuring a particular foods ability to neutralize free radicals. Free radicals within our body, which increase with age and within the conditions we live (pollution, toxins, etc..), cause oxidative damage and can contribute to cancer, age related degeneration and other diseases. Some high ORAC valued foods are blueberries, spices like cinnamon and pecans. Although I will continue to try and get high ORAC valued foods in my diet I am going to get back with the Greens formula (DC Greens) my friend Travis formulated. There are also plenty of other great Greens powders sold at stores like Henry’s and Whole Foods. Some of the ingredients in the DC Greens formulation are carrot juice, blueberry leaf, spirulina, red wine extract… I simply mix the powder in water and drink. My wife says she is not very fond of the taste, while I love how it tastes…..you say, “Tomahto” and I say, “Tomato”… Again you can try many different brands out there, hopefully you get it right on the first try. Pretty much most of what is sold at Whole Foods is a good product. And yes I highly recommend that you all work to try and get your disease fighting foods up (fruits, vegetables and nuts), yet I now recommend using a Greens formula as an insurance policy for high ORAC valued foods. I do carry the DC Greens product at the gym so you can ask me about it. I do this because for one I think Travis made a great product (www.DCnutra.com ), and secondly it creates a level of convenience for my clients. But again there are plenty of other good brands out there. 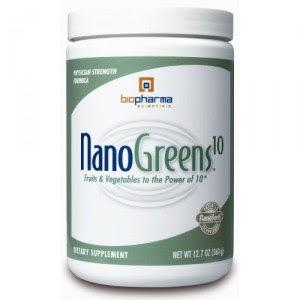 One other high quality brand is NanoGreens by Biopharma Scientific (www.biopharmasci.com) I think it is a no brainer now that we should all be taking one. Better late than never! Is It Bad to Cook Your Vegetables?